This may well be the least-known, and least visited, Anglican church in Norfolk. It is tucked away in the terraced streets of Cobholm Island, the northern part of the Great Yarmouth suburb of Southtown, near to where Breydon Water funnels itself through the town and out to sea. By any index, Cobholm is one of the most economically and socially deprived areas in England. Although inextricably linked with Southtown, it was historically in a separate parish. Southtown was a part of the parish of Gorleston, whilst Cobholm was part of Great Yarmouth St Nicholas. Despite this, Cobholm was in Suffolk until the 1920s. The church of St Luke was opened as a parish of ease to St Nicholas in 1908, a fact which is attested to by the foundation stone at the west end, but which is rather hard to believe when you look at the building. This is of course because of the two major 20th Century events in the history of Great Yarmouth, the German bombing blitz of 1941 and the floods of 1953, both of which caused serious damage. In proportion, the Borough of Great Yarmouth lost more of its buildings in the blitz than any other town in England. And then, it lost another 3,500 houses on the night of 31st January 1953, when the great North Sea came raging up the river mouth. Most of these were in the lowlying Southtown and Cobholm areas. Remarkably, only ten people were killed that night, a fraction of those who lost their lives further south in Felixstowe, Jaywick and Canvey Island. Perhaps the people of Cobholm and Southtown were simply more used to adversity. 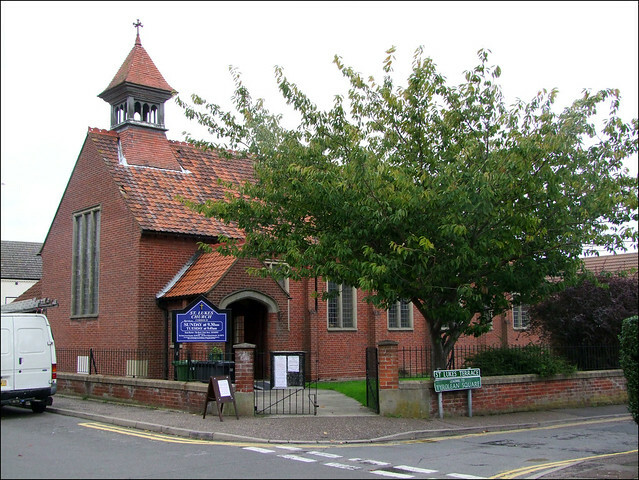 The 1908 church which was lost was a fine half-timbered structure very much in the Edwardian style. It had a large square bell turret, and small transepts to the chancel, which presumably contained the organ and the vestry. To see what it looked like, there is a photograph hanging inside the church. Or, alternatively, cross over the river to St Paul in Newtown, which was built ten years earlier and was almost identical before the addition of the south aisle. The architects there were Bottle & Olley, so they probably were here as well. The rebuilt church of 1960 was completely in brick, with an identical bell turret but without the transepts. The overall plan is very similar, but the style is very functional, more like a hall than the pretty little church which stood here before. Having said that, you step inside to a warm, beautifully kept interior, which retains something of the Anglo-catholic atmosphere which must once have been prevalent. All around, there is a sense of the pride this community keeps in its church, the finely crafted banners, the shining brass, the smell of polish. Every good parish church is a touchstone to the long generations of its community, and although there has been a church here for barely a century, it is certainly true of St Luke. The simple war memorial, In Memory of Our Fallen, contains no less than forty names, and there is also a beautifully painted Roll of Honour, one of the best of its kind I have seen in East Anglia. A separate memorial remembers Walter John Castell, a Private in the 7th Batallion of the Norfolk Regiment, who was killed in the Battle of Ypres in May 1917. It recalls that he was for 5 years Superintendent of the Infant School. Another poignant memorial is a display case to Jimmy and Fred Wright, two very good footballers. Tragically killed by enemy action 18th April 1941.